In just a few minutes, a commercial electrical fire can change everything. Whether your commercial property is for retail, office space, or residential rentals, an electrical fire can result in a devastating loss for everyone involved. The good news is that there are things you can do as a property owner to prevent electrical fires. 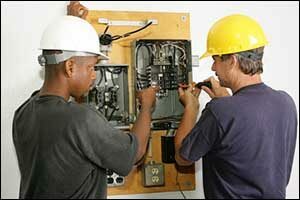 Commercial contractor services from a reputable electrician in the Greater Boston area can be a tremendous asset. If you are in need of commercial electrical in Wellesley, either for office, retail, warehouse, or residential space, you can count on the team at M Foley Electric to help you achieve your goals. Electrical services in retail are critical. Providing effective lighting for consumers in a shop setting can make all the difference in the success of any business. Lighting is used to highlight products, and to create a safe and secure shopping opportunity for customers. The first place to begin when preventing emergency services, repairs, and electrical fires is the electrical distribution system. The size of your system will vary, depending on the size of your business. This is typically a network of circuits that can include everything from wiring to breakers, fuses, and even step-down transformers, which are used for low-voltage equipment. Your electrician should start by checking to ensure that the distribution system is the right size for your business and that everything is installed correctly. The transformers are used to take the power that comes in from the main power grid and effectively reduce the amount of energy that is needed. It then distributes the power throughout the commercial electrical distribution system, where it is then provided to lighting, appliances, and equipment, as required. Old wiring needs to be replaced, improperly installed breakers and fuses need to be repaired and upgraded, to ensure that the power is effectively distributed throughout your business. Unlike a typical business fire, which can start from human neglect through oil or grease in cooking or improper storage of items in a warehouse, electrical fires can cause massive amounts of damage to your business before the fire department can even arrive. Regular fire safety inspections should prevent this, but the more proactive approach you can take to fire safety, the better. Don’t wait for the fire inspector to show up. Check your fire safety equipment on a regular basis to make sure that it is in good working order. Conduct fire safety drills with employees and do everything you can to reduce the chances that an electrical fire will occur in your business. Just by hiring professional electrical services for retail, office, warehouse, and commercial residential properties, you are already taking an important step. A professional electrician will provide quality commercial contractor services and deliver comprehensive inspections, repairs, and upgrades, as they are needed. Old wiring is by far the most significant source of electrical fires across the nation. If there is even just a single wire that is exposed on the exterior of the building, the wire will begin to deteriorate even faster. The naturally corrosive area around your building will increase this risk, and it requires emergency services and repairs as soon as it is identified. If your business experiences frequently blown fuses or circuits that trip regularly, this is a warning sign that there is a bigger problem. Outlets that are overloaded can cause overheating and will lead to failure. To prevent an electrical fire, work with commercial electrical in Wellesley with M Foley Electric. Our team can help you replace and upgrade fuses and circuits to meet the demands of your business. Hot spots are also a serious issue. If your electrical panel has any loose connections, short circuits, overloaded circuits, imbalanced electrical loads, faulty switches, corroded wires, or bad breakers, they can cause heat on the panel, which can lead to a fire. If you want to make sure that your business is safe throughout the year, make sure to contact M Foley Electric to perform regular inspections of electrical services for retail, office, warehouse, and commercial residential spaces. Our commercial contractor services will provide you with safety and security to prevent dangerous electrical fires. Give us a call at 1-857-829-0516 anywhere in the Greater Boston area. We work with our clients to provide preventive services, but we are also available for emergency services and repairs. Call today for a FREE estimate on any of the professional services we offer.